“Raw Water Pipeline” (RWP) is the term describing the 8 miles of pipeline used to deliver the untreated water from the main well field at Mulberry Point (just north of the Vermillion-Newcastle Bridge) to the water treatment plant. It was divided into three segments (awarded in two contracts). In the future another close to 6 miles of RWP could be constructed to connect additional wells that may be drilled in a different area. 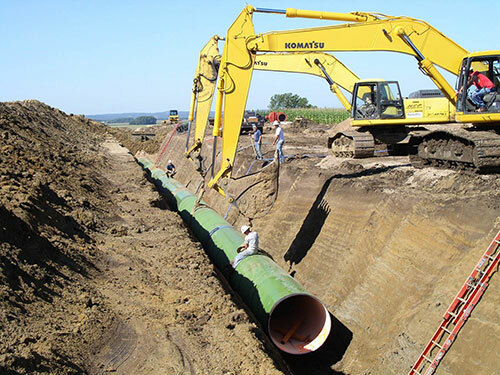 The first pipeline contract was awarded to Winter Brothers Underground of Sioux Falls in December 2003 and substantial completion was reached in October 2005. Final construction cost was $1.7 million. Starting at the main well field at Mulberry Point and heading north along Highway 19, this segment was three-quarters of a mile of 48″ diameter steel pipe, a half mile of 30″ and a quarter mile of 36″. The contract was awarded to High Country Pipeline of Penrose, CO in August 2004 and substantial completion was reached in February 2006. Final construction cost was $9.1 million. This segment was 6.5 miles of 54″ diameter steel pipe. Part of the segment was along Highway 19 and after reaching Timber Road went cross country until it reached the treatment plant site.